MANTI—A house in northwest Manti nearly burned to the ground on Wednesday, Jan. 30, partly no one was home when the fire started and by the time 911 was called and fire crews arrived, the structure was pretty much engulfed. The call for help came in from a neighbor, and by the time the Manti Fire Department arrived, flames were shooting through the roof of the home at 257 W. 400 North, the fire chief said. He speculated the fire may have been burning for more than an hour before it was called in. “We think the time of year, with so much chimney smoke and the smell of burning wood all around (the community), led to the fire being reported later than usual,” he said. The Manti Fire Department was first on the scene, along with Manti ambulance. However, the Ephraim, Sterling and Gunnison fire departments also arrived to help. After they arrived at the scene, fire fighters observed the walls and roof begin to shift and fail. They determined it was too dangerous to go inside the structure, and their efforts shifted to a defensive struggle to keep the fire from spreading to nearby houses. The ladder truck from Ephraim was brought in to help in those efforts. The owners and residents of the home were Ken Glenn; his wife, Janet, and their son, Jared. “We were able to salvage a few things, some mementos, but otherwise the house was a total loss,” Ken Glenn said. He said his family is currently staying at a local bed-and-breakfast inn. 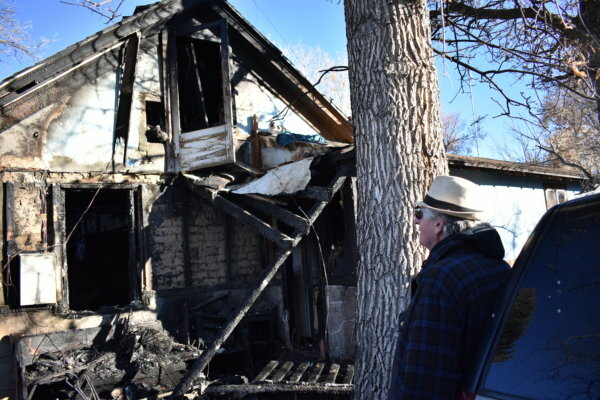 While they want to stay in Manti, and are working with their insurance carrier, they haven’t made any plans on how to re-build or start over, he said.